The colorful stars that begin to grace Kerala buildings in December from homes, to businesses, to places of worship have humble beginnings despite their current flashy status. 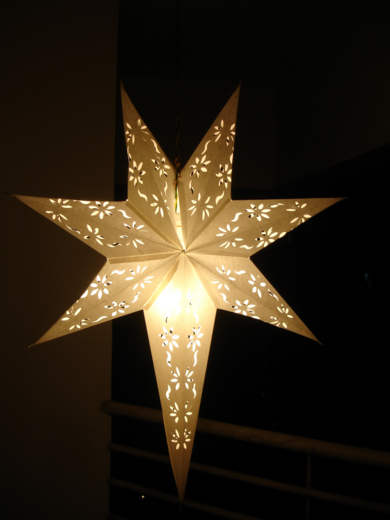 The were originally a simple white 7 point star that correlated with the beacon leading to the Christmas manger. Many of these folded and cut paper stars are the handiwork of a group of women in a fishing villages around the southern Kerala city of Kollam.The work of these homemakers is supported by about half-a-dozen enterprises who go from home to home distributing raw materials such as papers and glue, later collecting the finished products from them. The demand is so high that a season’s work begins in April-May, and even as early as January for those cases with a wide export market. Not all women in the community are experts in crafting the more elaborate stars, but those select few have enough work to keep them busy throughout the year. Similarly to our newspaper bag initiatives, the women who are less expert folders can assist with other aspects of production. The region of Kollam is known for coir handiwork and artisanal fishing, and in the past the women would join together to repair nets. But as this the use of traditional nets diminishes there is less communal work for the women to engage in. The stars are a good solution for women who may not be able to work outside the home. 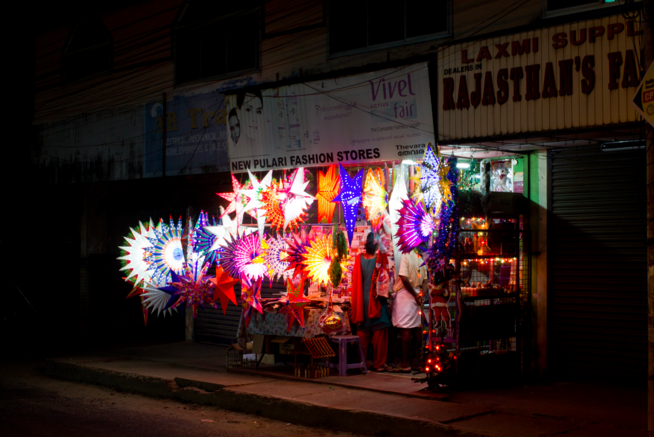 Several hundred households participate with these enterprises, creating an average of 100 stars per day, the folded and cut paper creations sometimes confections of color and shape. But in many homes, ours included, the traditional white still reigns.